For three years, the Council on Competitiveness HPC Users conference has brought together public and private sector HPC stakeholders to understand better the importance of HPC to innovation and competitiveness. This year the Council has been invited to partner with the planning committee of the annual international supercomputing conference SC07 to help organize a key industry focus section of the program called Masterworks. Masterworks is a series of 14 sessions that will showcase industry’s use of high performance computing with emphasis on driving productivity and innovation for business success. Industry executives from global corporations will highlight novel ways of applying HPC technology to achieve the transformational breakthroughs needed to ensure a competitive advantage—a critical part of the Council’s work for the past three years. In addition, this year we are adding a new CTO Roundtable as a capstone session to Masterworks. Leading CTOs and CIOs will discuss in a roundtable format the strategic value of HPC and how this critical asset is best positioned to contribute maximum business return for competitive gain. We look forward to contributing to this year’s Masterworks sessions and we hope to see many of our past HPC Users Conference attendees at the SC07 event in Reno. With technology, talent and capital now available globally, the U.S is facing unprecedented economic competition from abroad. America’s continued ability to create, innovate and improve more rapidly than our global competitors will be the key in the future to ensuring our sound economic growth, and guaranteeing an increased standard of living for our children and grandchildren. Often though, real innovation stalls due to the added cost, time delays, and/or safety and environmental concerns inherent in conducting the physical tests or building the physical models required in trying out new processes. An economy built on innovation requires different resources to address these challenges. Central among these resources is high performance computing. Just as a manufacturing economy depends on a ready supply of critical resources such as petroleum, tomorrow's innovation economy will depend on ready access to comparable new resources. We believe that high performance computers are at the top of that list and will be the "petroleum" to our innovation economy. They are the fuel that will propel and assist our researchers, scientists, creators, inventors, designers, and manufacturers to ask more questions, test more theories, try more designs, simulate more conditions and make more refinements in our research, development and manufacturing processes. An innovation economy that employs high performance computers will be able to more quickly find answers to the "what if" questions that drive the innovative process. If the U.S. is going to reach the heights at which new businesses and industries are created, we need the breakthrough insights that emerge from advanced simulation. We are convinced that future U.S. competitiveness will rest on just such a technological advantage. The Council on Competitiveness 2005 HPC Users Survey will address the state of independent software vendors (ISVs) globally, which industries/companies are dependent on which ISVs, user and ISV perspectives of the strengths and weaknesses of the ISV industry, and areas where partnerships could help to advance software development. Survey results will be released in conjunction with the Users Conference. Please check back here for more information. 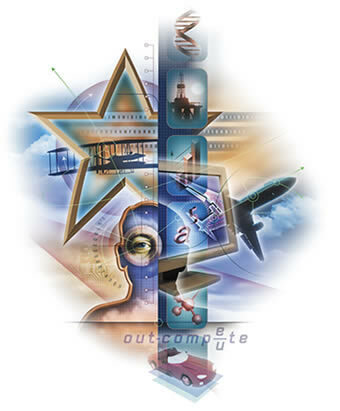 Please click here to download the 2004 Users Survey, which addressed the importance of high performance computing to industrial and national competitiveness, and the business and technical barriers preventing more widespread use across the private sector. Today, America finds itself at an inflection point, shaped by unprecedented shifts in the nature of global competition, and in the nature of innovation itself. The world is becoming highly interconnected, and competitive and economic interdependencies are growing. At the same time, where, how and why innovation occurs are in flux – across geography and industries, in speed and scope of impact, and even in terms of who is innovating. In many ways, the playing field is leveling, and the barriers to innovation are falling. High performance computing has been and will continue to be a key ingredient in America’s innovation capacity. It accelerates the innovation process by shrinking “time-to-insight” and “time-to-solution” for both discovery and invention. Along with theory and experimentation, modeling and simulation with high performance computers has become the third leg of science and the path to competitive advantage. With the help of high performance computing, innovations not yet imagined may enable us to achieve medical breakthroughs that lead to significantly better health across the planet; reduce substantially the design and development cycles for high-value products and services; develop affordable, environmentally-friendly alternative sources of energy; and expand access to the knowledge that can enable a more secure and satisfying future. High Performance Computing: Accelerating Innovation for Prosperity, builds on the realization that in a highly linked, competitive global environment, out-compete increasingly means out-compute. Participants will explore cutting edge problems that industry must solve to stay at the forefront of global competition, but that require even more computational capability than is available today to address them successfully. And because “extreme innovation” cannot take place without state-of-the-art application software to take advantage of the enhanced performance of these powerful systems, conference participants also will examine options for bridging the chasm between the software we have, and the software we need to drive more aggressive use of High Performance Computing across all industries. America’s capacity to innovate is the foundation for bringing our competitiveness to full fruition. Using high performance computing systems, America can unleash a new era of innovation-driven growth, creating new industries and markets, fueling wealth creation and profits, and generating high-value, higher-paying jobs to raise the standard of living for all of our citizens.